Have you ever had to reopen an old workbook – or worse, a workbook that was set up by someone else – and figure out what was going on in it, update it without being sure that you weren’t going to break some of the calculations? 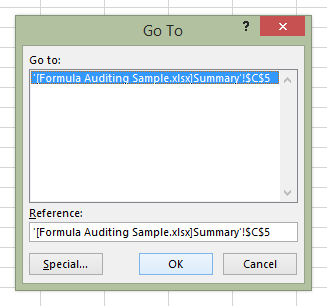 Of course, you may already know about the show/hide formulas in Excel tip but Excel has more useful tools. Broken Formula or Broken Workbook? 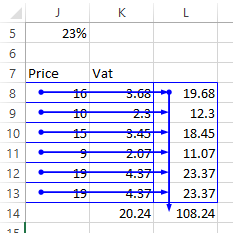 Good modelling techniques are really important when you develop spreadsheets, whether using Excel or other programmes. Training courses often focus on features rather than best practices unfortunately, propagating some really bad stuff. Some users are self-trained too, fair play, but too often that means even looser interpretations of spreadsheet basic security and integrity. By the time I am called in to help prepare a workbook for reporting, it can be hard to figure what formulas are supposed to do in the first place and whether they do that at all. For that reason, this week we are looking at our first set of auditing tools: Trace Dependents and Trace Dependents. Click Tools, select Formula Auditing and choose the option to display the toolbar. So far so good, yep? Before we continue, why don’t you download the sample file? In the example below, before changing the rate (23%) in J5, you might want to figure out which calculations will be impacted. Hopefully you can guess by looking at this one, it’s rather simple but let’s see how Trace Dependents can helps us audit the workbook. 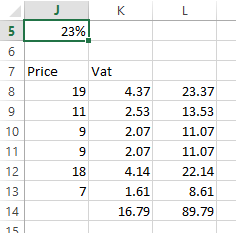 Select cell J5 which contains the rate. Click Trace Dependents. Blue arrows appear which indicate formulas which use this reference. 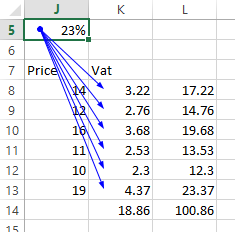 Click the same Trace Dependents again and again to reveal the sequence of formulas using this rate. I thought an animation might help… You’re welcome. That was alright, wasn’t it? There’s a link to the sample file at the end of the article so you can try that yourself. Right now, continue to the next page to see the other commands in that group and how you can make this work across multiple workbooks… Thrilling? Yep, I think so too. Click Remove Arrows to, well, remove arrows all at once or look in the command dropdown to specify if you want to remove precedent or dependent arrows only. Note that arrows disappear as soon as you save the workbook anyway or anytime you close the workbook. They are meant to help you as you troubleshoot formulas but not meant as ways of documenting your spreadsheet. OK, that was easy, wasn’t it? Next we’ll explore what happens when formulas link to external sheets or workbooks. Double-click the dashed arrow line. The Go To dialog appears which lists all linked references. Highlight one of the references (there is only one here) and click OK.
Now Excel has’taken you’ to that reference. Try it yourself on one of your spreadsheets or download today’s sample file. Next time, we will explore other ways you can troubleshoot your Excel workbooks. Comment, Share, Like or Tweet – I bet you know someone else who uses Excel.